Note: The restaurant is currently under new management with a new menu. My introduction to Persian cuisine came by in a most unlikely and circuitous way. My twin brother and I were college students in Memphis, TN, and we were active members of the International Student Union. Its president was a charming and feisty young Persian lady that my brother had started to date and spend a lot of time with. On the weekends, we would go over to her mother’s house in Midtown, and walking in, you were immediately enveloped by the most wonderful waft of exotic food that awaited us. One of my favorite dishes was a chicken rice dish that was delicately perfumed by a handful of fresh dill, and it was usually brought out with the golden-brown bottom crust nestled on the top as its crown, which was considered the most prized part. After dinner, we would sit around on the plush carpet and pillows while we cracked nuts and peeled fresh pomegranates as dessert, while sensual Persian music played in the background as we tested our limberness with some rhythmic hip gyrations aided along by some youthful imbibing. My college days in the 80’s were filled with excitement and cultural adventure, despite being in the Mid-South and the “quiet uneasiness” that saturated its air. A few years ago, having already relocated to the DC metro area, I moved from the middle part of the county to the most northern part, Laurel, MD. It was a big change for me especially culinary-wise. In my new area, I have at my doorstep a wide variety of restaurants, especially ethnic ones, that my old stomping ground was severely lacking. Just off the city’s main thoroughfare is Mediterranean Kabob that sits in the corner of the courtyard of a fairly new set of condominiums. When I first stepped into its doors, I was glad to find a place where decent Middle Eastern food was served and close to me. It has the usual fare that we would usually associate with this cuisine: Kabobs, Pita Bread, Stuffed Grape Leaves, Basmati Rice, Falafels (real good, btw), Gyro sandwiches, and Baklavas for dessert. But since last year, a $10 lunch buffet has been added during the work week, and here we see the restaurant offering the customer some really exciting and unique Persian dishes that have made me sit-up with attention. Available on the buffet line are the usual cold dishes of a simple Salad, Tabouleh, Flatbreads, and Cucumber Yogurt Sauce. The salad was nothing out of the ordinary except for the accompanying spicy cilantro sauce that added a kick to the mild greens. The Tabouleh was decent but I would prefer more lemon juice that would make my mouth pucker the way I like this bulgur wheat and parsley salad. When I was visiting the last time, a young Persian, Siamak, and his brother were making and baking different Persian breads from scratch. 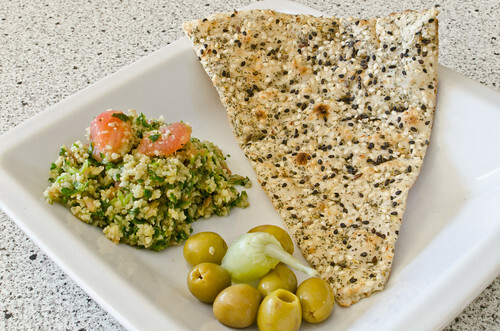 I was presented a most interesting flatbread that had a scattering of black and white sesame seeds, along with some dried herbs and exotic Nigella black seeds (akin to poppy seeds but more fragrant) on top of its surface. The toasted seeds made the bread very irresistible with their nuttiness, coupled with the fragrance from the dried herbs. A good started indeed. Usually, there is a wonderful hearty soup on the buffet line which is far from the usual buffet offering. On one visit, the opener for my meal was a most interesting soup – Ashe Tomato. Nila, the main cook, explained to me that it was a soup that is cooked by Turkish immigrants in Iran. 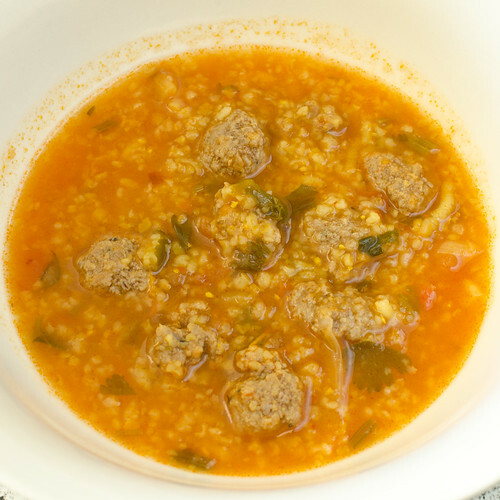 It was a light and slightly spicy tomato broth that was made with bulgur wheat, couscous, cilantro, fresh chilis, and marble-size beef-and-onion meatballs, which were surprisingly light and added the necessary meatiness to the soup. It definitely piqued my curiosity, and I had to refrain from filling up on it after a couple bowls of this deliciousness. With a few visits, I have fallen in love with Khoresht-e Fesenjoon, an exotic concoction of chicken in a pomegranate concentrate and ground walnut sauce. The first time I tasted it, I was transported to another world by the interesting and slightly sweet-and-sour flavors that had permeated the meat completely, judging by the amber-colored interior. According to the manager, Manoocher, it takes 3 hours of patient stirring to produce this ancient recipe, that at times he is up late making it. 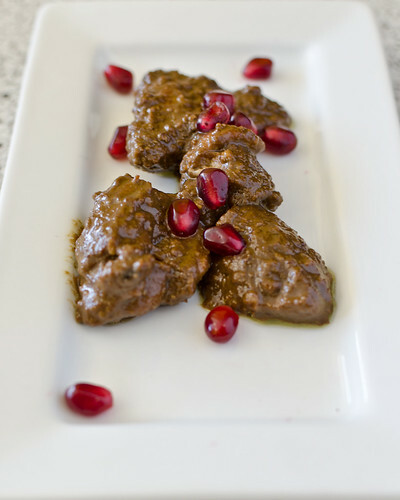 Such care in cooking this dish produces a thin layer of light green walnut oil that makes this dish prized by older Persians for its heart-curative qualities, according to Nila, along with the antioxidants in the pomegranate. I must admit that it is a rather rich dish with a thick sauce that clings to the moist and flavorful pieces of meat. But the interesting flavor profile makes one wanting more of this exotic dish. It used to be offered on the line only once a week, but due its popularity, it makes a daily appearance, which I am glad to see. The Chicken Kebab is good here. 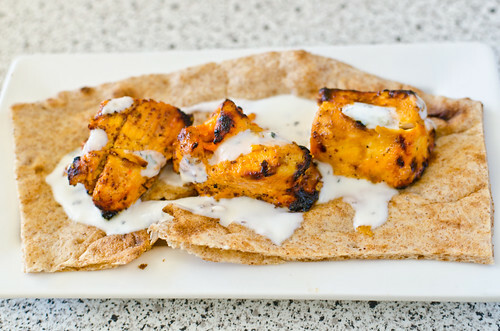 Chunks of chicken breast have been marinated and quickly cooked in the tandoor. The meat is still moist with the edges barely singed by the high heat. Usually there is freshly baked naan bread served along with it, but in my last visit, I was offered some wholesome whole-wheat flatbread. The yogurt-cucumber sauce provided the perfect moist accompaniment to this tasty bite. A dish often served on the buffet line is a tomato stew consisting of chunks of beef, wide slices of sautéed eggplant and tomato, onions and turmeric. The meat has been stewed long enough to have absorbed the flavorful liquid and be fork tender, along with the wide slices of vegetables that hold on to their integrity after a short stay (15 minutes) in the pot. The soft vegetables provide the necessary textures and flavors that act as the perfect foil while adding contrast to the bolder meat. All these elements make this dish very delectable and complex, with a certain homely simplicity at the same time. 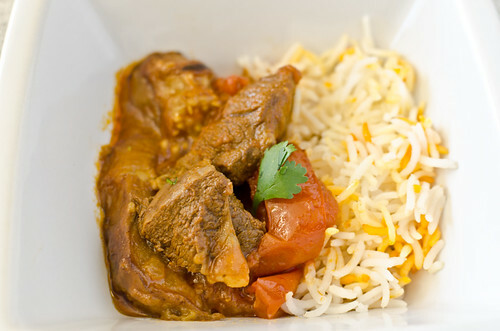 The fluffy basmati rice is the perfect backdrop to this wonderful saucy dish. 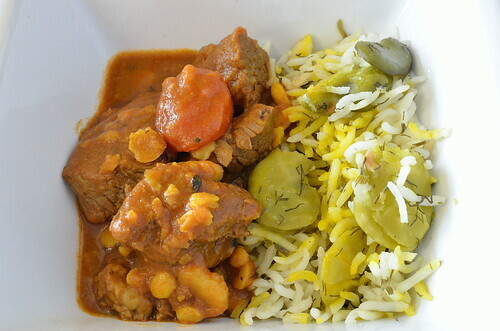 On another visit, I tasted a unique Persian dish for the first time – Gheymeh Beef Stew. It was an interesting thick stew of beef chunks, lentils, and potato. This dish is lightened by the addition of dried limes that add the citrus sour note to the dish that would otherwise be quite flat and heavy tasting. Savoring it for the first time was an eye-opener as I was trying to discern the interesting flavors that were quite foreign to me. A side of Fava Bean Rice perfumed by fresh dill and saffron (the real stuff) was the perfect accompaniment to the dish. This pair is not a daily offering on the buffet line, but it is worth catching when available. Vegetarians are not forsaken here. Besides the salads, rice, and breads, there is usually a vegetable offering. 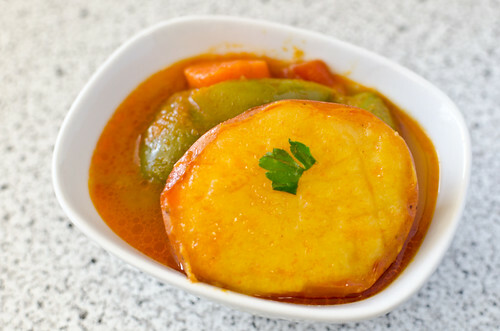 A light potato, green pepper, and carrot stew on the last visit was tasty and quite fulfilling. The potatoes were cut into large portions, enough to give one the feeling that the tuber was not going to allow itself to be overshadowed by the other bolder meat dishes. Another vegetarian offering on a previous visit consisted of a potato stew seasoned with ginger, cumin, coriander seeds, and a little cinnamon. On this day I almost became vegetarian by this wonder of a dish, which made me nearly forget the day’s other offerings – few can make vegetables this exciting as the kitchen did with this dish. If you happen to be in Laurel during the weekday during lunch time, it would be amiss not to stop by Mediterranean Kabob for the lunch buffet that offers exotic and unique Persian dishes that sing about a glorious history of a wonderful cuisine. The small crowd of Persian customers savoring the dishes and the sound of Farsi in the air are a good testament to the level of cooking here. Under the hands of Nila, the cook, these perfectly seasoned dishes are tempting for one to go back for repeats even when conventional wisdom says to go light on the midday meal. However, after a few fork and spoonfuls, you will not regret having over-eaten, and maybe start planning the next time you would pay visit to this modest yet wonderful eatery.